Classic board games are some of the funnest and Monopoly is one of the best of all time. If you are of a certain age then you definitely played this game as a kid. But now in the digital era everything is played on computer, phones, or tablets. Now you can play the classic Monopoly game on your tablet. Electronic Arts has finally released Monopoly Millionaire for the Kindle Fire this December and it’s on sale for $0.99 for a limited time. 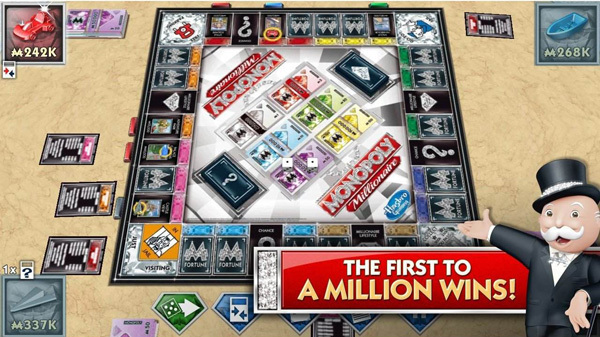 Monopoly Millionaire is not exactly the classic game with Park Avenue and railroads. In this game to win you have to reach a million dollars first with three difficulty levels. There are updated properties like Bling Beach and Paradise Island. There are fortune cards, private jets, yacht clubs, and much more. This is a high-octane and high rolling Monopoly game updated for the new generation. But even good old classic Monopoly players can enjoy this games. Currently it’s on sale for $0.99 rather than its usual $4.99 price tag so grab it before the sale ends. The app is also on sale in the Google Play Store for non Kindle Fire users as well. Check it out and let us know what you think.